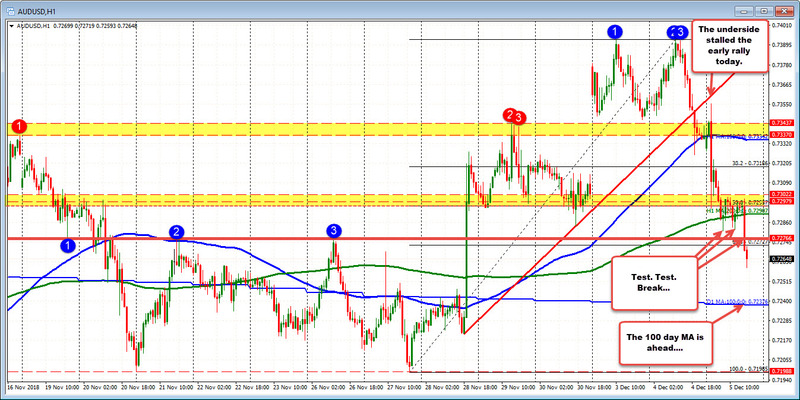 The AUDUSD turned sharply lower after the GDP data came out much weaker than expectations (0.3% vs 0.6% expected). The fall lower took the price to the 50% and the 200 hour MA where the price waffled up and down for much of the London morning session. Over the last few hours, the pair has been pushed on more dollar buying. Technically, the price has moved below the swing level at 0.72766 and the 61.8% at 0.72727. The lows earlier today reached That area is now 0.72809. That area (from 0.72727-809) is now a risk level for shorts. Move above and the bearish trend is more muddy.